The Giant Danio is a great addition to a large freshwater tank, especially if you're already raising larger fish such as Chiclids. A schooling species, these large fish should always be kept in a group of six or more; as they zip around your aquarium you'll be impressed by their flashing scales and high energy. The Giant Danio (Devario aequipinnatus) originates from the hill streams and standing waters of India, Nepal, Bangladesh, Myanmar, and northern Thailand. Their natural habitat is clear water, ranging from free-flowing to still water. 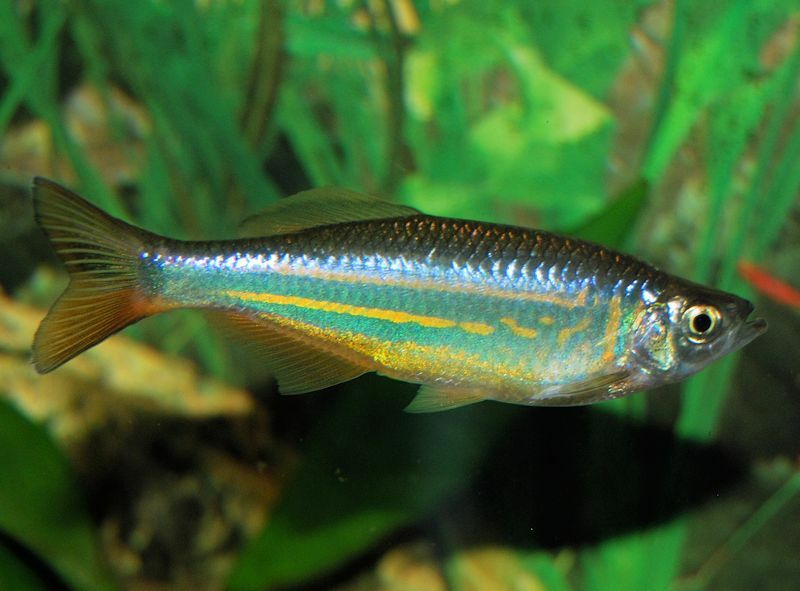 The genus of fish has changed over the years, and it is common to see this species referred to by the name Danio in literature. The Malabar Danio (Devario malabaricus) was once considered the same species, but it has been identified as a separate but closely related species. Aptly named the Giant Danio, this deep-bodied species can reach 4 inches in length, and even larger in its natural habitat. The body is iridescent gold with steel blue-colored spots and stripes running lengthwise from the gills to the tail. In females, the stripe bends upward at the base of the tail, while in males this stripe runs straight, extending through the tail. The fins are pale golden in color and rounded, while the tail fin is forked. There are several color variations, including an albino one. Giant Danios are active and swim rapidly throughout the tank, preferring the upper levels of the aquarium. They are a schooling fish and should not be kept by themselves. Due to its size, the Giant Danio is not well suited to being kept with smaller fish. The rule of thumb is not to combine small fish with any fish that is large enough to swallow them. Small characins would be at risk, but medium to large characins may be suitable. Any medium- to large-sized bottom-dwelling fish will do well with Giant Danios. Slow-moving fish, such as Angelfish or Bettas, are not suitable as tankmates with Giant Danios. Smaller community fish are also unsuitable tankmates for Giant Danios. They make excellent additions to Cichlid tanks, as long as the Cichlid species are not overly aggressive. Giant Danios should always be kept in a school of a half dozen at a minimum, preferably more. Smaller numbers often result in aggressive behavior toward other fish, and even one another. The size and activity level of this species requires a roomy aquarium to provide sufficient swimming space. Although a 55-gallon tank is the recommended minimum size, it is possible to keep them in a 30- or 40-gallon tank if it is the long variety. Any tank under 36 inches in length is simply too small to keep Giant Danios comfortably. Because they have a tendency to jump, keep the tank kept well covered at all times. Filtration should be sufficient to provide a steady flow of water and maintain good water quality. Decor to mimic a river or stream habitat is ideal but not required. To mimic their natural environment, use river gravel or sand, driftwood, and sturdy plants, such as Anubias, along with the periphery. Giant Danios are omnivorous and will accept a wide range of foods, including flake, freeze-dried, frozen, and live foods. To bring out the best coloration, offer live foods, such as bloodworms, brine shrimp, daphnia, or mosquito larvae. If live foods are not available, substitute the frozen counterpart. Occasionally include vegetable flakes in their feedings to provide a well-balanced diet. Females are attractively colored but generally are less vivid than the males, and the horizontal blue stripe takes an upward turn just before it meets the tail fin. The abdomen of the female is fuller and rounder than that of the male. Males are thinner, and the horizontal blue stripe remains straight, extending on through the tail fin. They are also noticeably slimmer than their female counterparts. Like other members of this family, Giant Danios are loyal to their mates and remain with them for life. Giant Danios are relatively easy to breed and the fry fairly easy to raise. Spawning should be attempted in a roomy tank that has some exposure to sun, if possible, as natural sunlight triggers spawning. Keep the water warm, in the range of 77–82 F (25–28 C), with a pH of 7.0 or below. Provide fine-leafed plants, such as Java Moss, or a spawning mop. Condition the breeder pair with live foods such as brine shrimp. During spawning, up to 20 eggs are produced during each pairing, which continues until as many as 300 are scattered on the plants or spawning mop. Remove the breeding pair once the eggs are laid, as the parents will consume the eggs and fry. Eggs hatch in 24 to 36 hours, and the fry become free swimming approximately 48 hours later. Feed the fry commercially prepared fine fry foods or freshly hatched brine shrimp.